The British used Provost Dungeon for prisoners during the American Revolution. 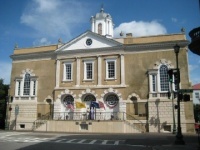 In 1774, the Old Exchange Building hosted the delegate elections for the First Continental Congress. Built in 1772, its original purpose was to assist with heavy import and export trade in Charleston. The Exchange was built in the Palladian style of architecture with a facade constructed from imported Portland stone. Having withstood war, earthquakes, and hurricanes, the building is strong. Part of the Half-Moon Bastion was excavated here and is the only visible section of the old Charlestown fort. Today, the South Carolina Daughters of the American Revolution run both the Old Exchange Building and the Provost Dungeon. All three floors of the main building are open to the public as a museum focused on the city's history and its role in American history. On tours through the dungeon, visitors are educated about the many pirates jailed during the 1800s. The Old Exchange Building regularly hosts symposiums on topics relating to Charleston's history, with the building also available to rent after hours as a function venue.